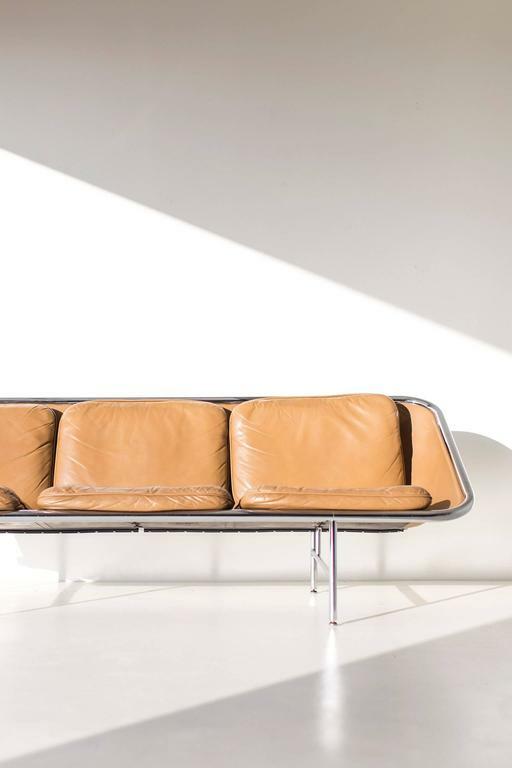 If you follow along with our blog, then you’re likely familiar with our Architect Spotlight series that showcases our favorite architects and the homes and buildings that inspire us. This month, we’re diving deep into the work of I.M. Pei, a Chinese-born American architect whose modern, abstract work is some of the most recognizable in the world. Even if you’re unfamiliar with I.M. Pei, you’re likely familiar with one of his most famous structures: the glass pyramid structure at the entrance to the Louvre in Paris. His style uses geometric shapes and traditional Chinese architecture influences to create a look that’s nearly instantly recognizable. Pei was born in 1917 in Guangzhou, China, but later moved between Hong Kong and Shanghai. Pei move to the United States in 1935 to attend architecture school at the University of Pennsylvania, though he quickly transferred to MIT. 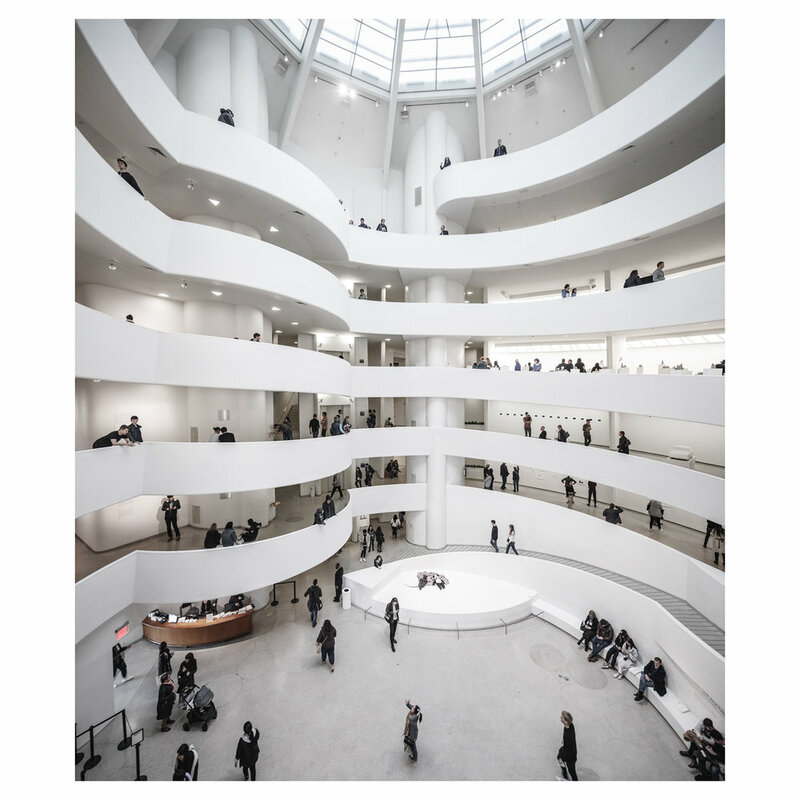 Pei befriended Bauhaus architects Walter Gropius and Marcel Breuer after entering the Harvard Graduate School of Design, which led to him being recruited to work for William Zeckendorf, a real estate magnate in New York City. In 1955, Pei established his own firm, I. M. Pei & Associates, which eventually became known as Pei Cobb Freed & Partners. The firm created the National Center for Atmospheric Research in 1961, which was his first building to gain major recognition. Pei is also known for the John F. Kennedy Presidential Library and Museum in Boston, The National Gallery of Art in Washington D.C., and The Bank of China Tower in Hong Kong. Pei’s work is modernist in style with cubist themes throughout, and while many tried to categorize him as a Modernist, he rejected all architectural trends, saying, “An individual building, the style in which it is going to be designed and built, is not that important. The important thing, really, is the community. How does it affect life?" Today, I.M. Pei is 101 years old and still kickin’ — a feat almost as impressive as the rest of his incredible career. If January seemed to drag, February was here and gone almost before we even knew it. It was a short but productive month, and while we haven’t been promoting any large projects lately, sometimes it feels good to work slow and steady to keep things on track. That’s one of the things we’ve learned about running a business over the past few years: it’s just as important to stay focused during slower seasons as it is during the hectic, jam-packed periods. Here are our favorite, most inspiring things that we saw online and IRL this February. Image of Rian Dawson’s monochromatic bedroom featuring our custom pieces. Your photos. If you follow us on Instagram (and we hope you do! ), then you may have noticed that we’ve started sharing our favorite customer photos on our Instagram stories. Not only does this help us to show our appreciation for your business, but we hope that it also inspires you guys and shows you how to style our pieces in your own homes. Freestyle Friday. In other Instagram news: did you guys see our #1767FreestyleFriday announcement? Every Friday, we’ll be posting a one-off piece designed and created by one of our artisans in the shop. It will be available to purchase for 24 hours, so if you see something that you like, shoot us a DM to purchase one of these one-of-a-kind designs. Monochrome walls. 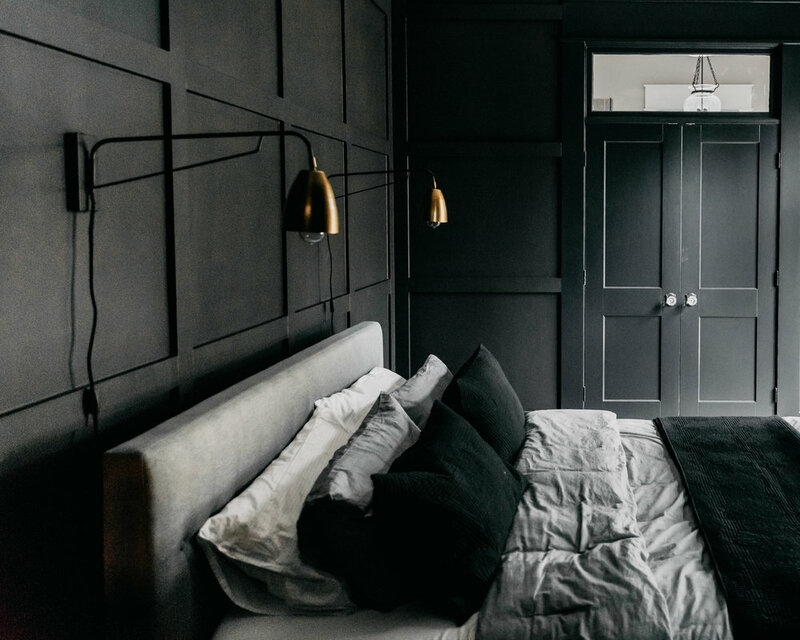 We’re always looking for new design trends for our interior projects, and lately we’ve been interested in monochrome painted walls. We’re talking walls to trim to ceiling — the more dramatic, the better. What do you guys think about this moody look? Bespoke furniture details. As we continue to move more and more into the custom furniture world, we’re starting to research bespoke furniture with details that are unique specifically to that piece. 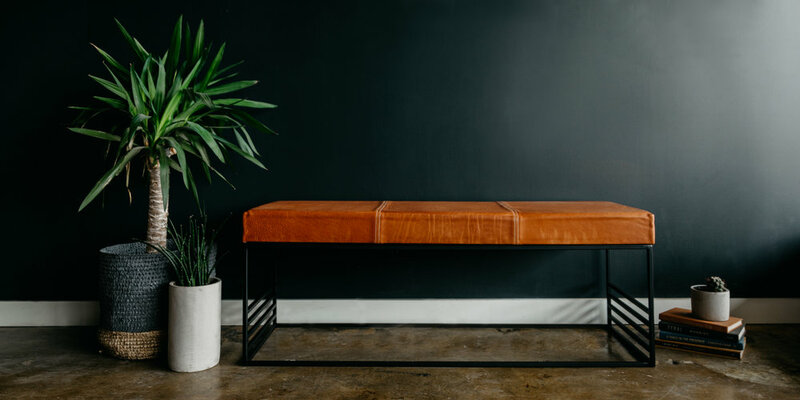 You might have seen our recent post about the custom leather bench we created in collaboration with Joey from Lockeland Leatherworks, featuring milled harness leather sourced from Wickett & Craig Tannery and reinforced French seams for lots of texture and visual interest. We’re also hoping to explore more unique details and intricate designs, so if you have an idea for a piece of one-of-a-kind furniture for your home or business, shoot us an email! Sunday dinners. Lately, we’ve been having friends over on Sunday evenings for low-key dinners to relax and recharge before the week begins. It’s a great way to connect with the people we love, slow down and get ready for a productive week. Do you have any favorite recipes or rituals that help you wind down on a long Sunday? New design books. We love a good coffee table book, especially when it’s one that features beautiful interiors and tips for creating a space that’s all your own. Lately, we’ve been admiring Abode: Thoughtful Living with Less, from the owners of San Francisco’s General Store, and At Home in Joshua Tree: A Field Guide to Desert Living by Sara and Rich Combs, owners of the Joshua Tree House. One of the best parts of our Nashville shop and showroom is that it’s large enough to share with our friends and fellow makers. Our friends at Lockeland Leatherworks share a space at the shop, which allows us to do the occasional custom project featuring our wood or metal and their gorgeous leatherwork. Recently, we created a custom bench for KT, a client of ours in the Gulch neighborhood in Nashville. KT is a regular client who we’ve gotten to know pretty well over the years, so we had a good idea about what he was looking for. For the seat cushion, Joey from Lockeland Leatherworks created a leather cover with some gorgeous stitched details. He sourced the leather from Wickett & Craig Tannery in Pennsylvania, and he decided on their vegetable-tanned Milled Harness Leather because of its buttery, supple feel (Joey’s words, not ours — he’s the leather guy, after all). The cushion features reinforced French seams and contrast stitching to keep it sturdy and ensure that it lasts through years of use, as well as to add some beauty and obvious craftsmanship when you get up close. For our part, we created a hand-welded, powder-coated steel frame that would provide a sturdy base for the bench. We added some visual interest with the slatted bottom, but we kept the whole thing fairly minimal to really let the leather cushion shine. We love the end result — it’s equal parts modern and classic, it blends high style with long-wearing function and, best of all, it’s a perfect example of what we can accomplish when we collaborate with the other skilled artisans in our shop. Are you interested in commissioning a custom piece of furniture (or something else) from 1767? Let’s hear your ideas! Email us at hello@1767designs.com. 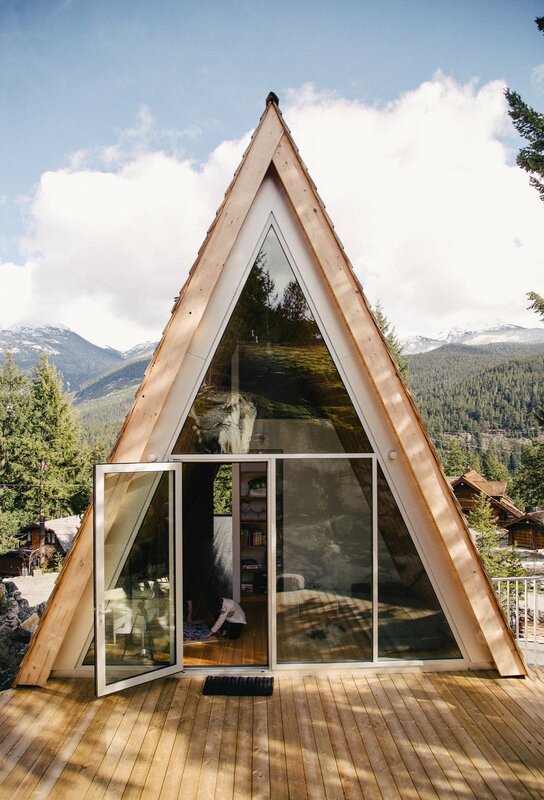 There’s no doubt that tiny homes have been taking over for the past few years now, and New Frontier Tiny Homes is one of our favorite names in the tiny home game. We’ve worked with them in the past on their Escher Tiny Home, so we were really excited to collaborate again on their Orchid Tiny Home. New Frontier describes this home as their take on a “contemporary, gable farmhouse design,” which is definitely a cool and unique merging of two different design styles. Inside, there’s a lofted king-sized bed for the main dwellers, as well as a hideaway bed for guests. 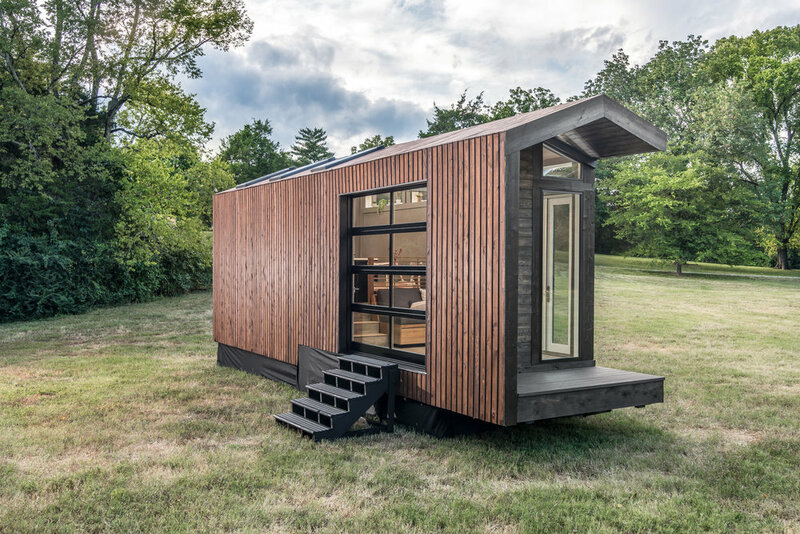 It may be tiny, but the Orchid Tiny Home also packs a fully functional kitchenette, dining nook, central hangout area and a pretty luxe bathroom into its minimal square footage. David from New Frontier Tiny Homes is very much the brains behind everything we work on with him. He designs everything to very precise specifications, and we simply act as builders to bring his vision to life. 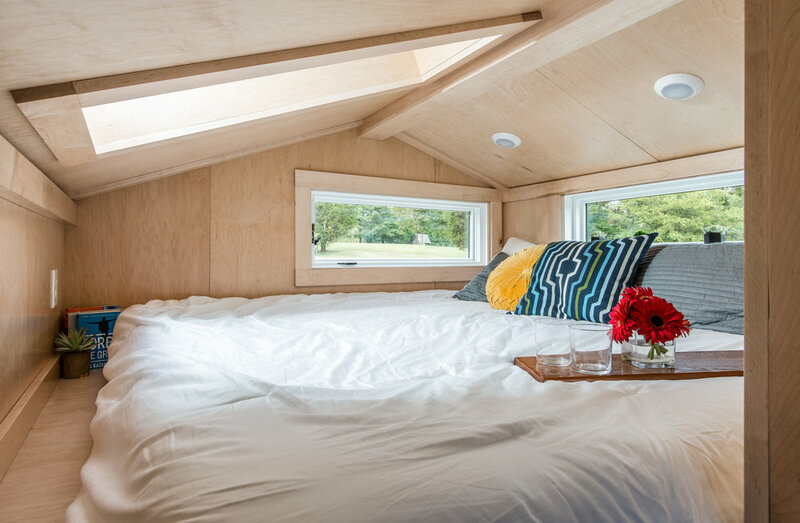 For the Orchid Tiny Home, we built out all of the interior trim. The sleek, minimal interior includes maple plywood treatments on all the walls, the LED valance lights, the slatted wood railings and the rest of the trim. We worked in partnership with David to help bring his vision and design to life, and we couldn’t be happier with how it turned out. There’s nothing we love more than collaborating with our clients on projects like these. Whether the client has a very specific vision like David or prefers for us to take the reins on the design and build, we’re passionate about creating a creative environment that’s open for all kinds of collaboration. If you’d like to hire 1767 for a project of your own, you can reach us at hello@1767designs.com. The only thing we like more than working together with our customers to create beautiful, functional custom pieces for their homes is working with our customers to create lots of custom pieces for their homes. Rian Dawson is that type of customer for us here in Nashville. 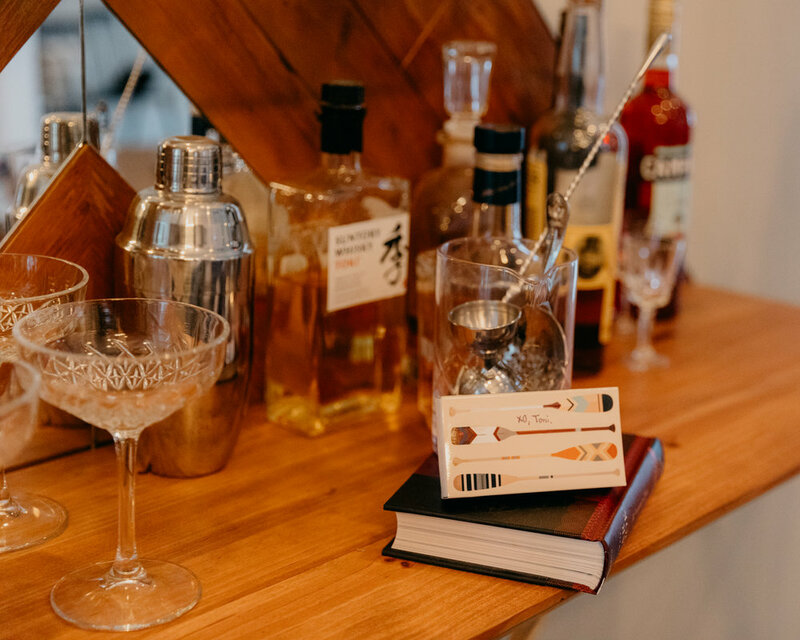 We first worked together earlier last year on this floating bar, which was kind of a dream project for us. Once the project was done and installed in Rian’s home, he contacted us to create a few other pieces to really tie the rooms together. Rian’s interior designer, the talented Zoë Cullen, took the reins on this one, and we loved helping to bring her vision to life. If you remember, we created the floating shelves to act as a sort of hybrid bar and shelving unit. It features reclaimed wood from Layman Drug Co., a music production studio in Nashville housed in what was once a pharmacy back in the 1890s, a steel frame structure and glass shelves. The back of the bar is accented by mirrored elements for a bit of visual interest. Rian is a musician, so of course he has a killer vinyl collection. In his living area, we built some floating record shelves to both store the records and put them on full display. The reclaimed wood pops against the matte black wall, and his turntable sits just below. On the flip side of the wall is a fireplace, and we created a floating wooden slab fireplace mantle with just the right amount of rustic detail. We also added a custom metal fireplace grate beneath with a diamond shape in the center and arched details around the edges. To finish things off, we created an oversized custom mirror for Rian’s bedroom. The room is painted matte black with some really cool wainscoting, so Zoë wanted to add to the room without overpowering it. All it really needed was a giant bent steel framed mirror and not much else, so that’s just what we made him. Finally, Zoë came to us with a design for a solid white oak dining table to replace the round table Rian had in his dining area. While the new design is still round to allow for easy access throughout the open concept space, it has a slatted detail around the base made of white oak half rounds to add some unique detail. We built the table to Zoe’s specifications, and we couldn’t be happier with the finished product (or more excited to see it in Rian’s space). Want to get started designing your own space? Email us! Hello@1767designs.com or take a look at our past projects here.